Amber Jewelry Information. Learn From Baltic Amber Craftsman. If you've been noticing the huge upward trend in owning a piece of precious Amber Jewelry you probably already know the value of Baltic Amber. Talk about "treasures"! Over 45 million years old and containing tiny Inclusions of Insects and plant life from that period in time is nothing short of the most valuable collection in the world from a scientific standpoint. Of course we owe the continuing upward visibility and demand for natural Amber to some extent to the Internet. With some Baltic Amber available at very reasonable prices, we can expect the surge to continue for some time. So, if you're now thinking you might be in the market for Amber Jewelry, you should read about what the real deal is. First time buyer? Keep it simple! Select a Amber Necklace or Amber Bracelet and choose from the many colors beautifully captured in Amber. Purchase your Amber Jewelry (and most importantly make certain you are buying the real deal) and then you can get comfortable with the beauty of what you own first. Should you decide to expand your collection over time, again be certain to enhance your treasure trove with only Genuine Baltic Amber as the value will grow and be retained. Formed over 45 million years ago, Baltic Amber (succinite) is an organic substance, a Fossil Resin produced by pine trees. The climate became warmer and trees started to exude big amounts of resin. In spite of the many processes, which the resin went through to transform into Amber, it remains in the fossil stage, i.e. is subject to oxidising and polimerisation. Since this process is ongoing, Amber keeps changing so we can assume that it is a "Living Stone" friendly to humans. Amber is light, its density is comparable to that of seawater and ranges from 0.96 to 1.096 g/cm 3. This is a key practical benefit, because it means that large Amber Jewelry can be easily made and comfortably worn. The largest (and probably the most famous) deposits of Amber are found in the Baltic region. In fact, these deposits represent approximately 80% of the worlds known Amber. Natural Baltic Amber can be scientifically dated between 35 and 45 million years old - No wonder it is one of the most precious substances in the world! And it certainly one of the most treasured gems, fashioned and refashioned into countless items in countless ways from amulets to jewelry to household items to great walls of artwork. The magic and mystery of amber lives on. Baltic Amber is considered the highest quality in the world and Amber's value is chiefly determined by its color, clarity, and the size of the nugget. Some collectors also place a higher value on pieces that have Inclusions Inside Amber. In general, the most valuable Color of Amber is rich yellow. A deep cherry red amber from ancient conifers also commands a high price and is relatively rare. 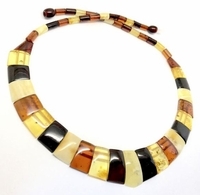 To give you a better idea about what is going on with prices, for instance, Perfectly Round Baltic Amber Butterscotch Beads command high prices. For instance, 10-15 mm natural Baltic Amber Beads in diameter are approx. $13-15 per gram. Smaller beads cost a bit less and larger ones more. Clear Amber is more valuable than pieces that look cloudy or opaque. Baltic Amber is unique among gems for its ability to contain other once-living things within it. Nowadays the market is full of so-called "reconstructed, or "modified" Amber, when an amber bead is made out of several small pieces of Amber glued together. Natural Baltic Amber means that the piece of Amber Jewelry or a bead is carved out of one piece of Amber. If you need Amber Jewelry for healing purposes, make sure that you buy Baltic Amber as it has the highest concentration of the Succinic Acid. It can be polished or not. Polishing does not alter the healing properties of Amber. All polished Amber are treated with heat, pressure, humidity, etc. The treatment makes the beads more appealing and pretty. Treated amber is still natural and, of course, real. Baltic Amber has been treated in different ways for hundreds of years. Amber often reveals its full beauty only after treatment. Amber Jewelry is a favorite for many. By learning some Baltic Amber basics, you will be well prepared to find a beautiful Amber Jewelry and have fun doing it. Learn more how to choose and Buy Amber Jewelry Online.